Pre-season: Real Madrid 1-3 Manchester United | The Real Madrid Fan! 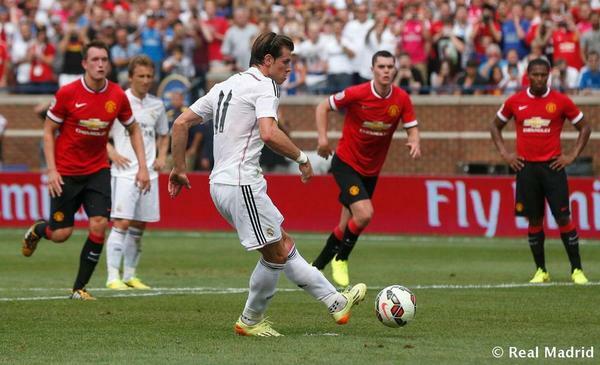 Real Madrid ended their pre-season tour of the United States on a sour note with 3-1 loss to Manchester United with Gareth Bale scoring the only goal for Los Blancos from the penalty spot. Having already been thrown out of the competition, Real were out to salvage some pride and make things tricky for United but neither of the situations happened in Michigan. United took the lead with a beautifully constructed move in the 21st minute which was comfortably slotted home by Ashley Young on Iker’s near post after Welbeck spotted his team mate with room to take a shot. While Iker should have done better and not been beaten on the post, the defence reacted slowly and displayed a herd mentality towards the ball. However, Bale restored parity six minutes later after he won the penalty and then converted it in the 27th minute. Showing his usual burst of pace, he sped into the box but was tugged back from behind by youngster Michael Keane as referee pointed to the spot. Bale stepped up, stuttered and made no mistake in scoring the equaliser. Ten minutes later, Ashley Young whipped in a cross from the left and as Rooney attacked it with Ramos right behind, Iker was blindsided and the ball made its way without getting a touch from the England striker’s head. At half-time, United rightly led 2-1. In the second half, Real Madrid dominated possession but unluckily for them, didn’t have too many shots on target. On one occasion, Bale provided a pass for Carvajal and the latter turned it for Isco but Isco’s pass was blocked ending a neat passage of play which could have resulted in a goal. Later, Gareth Bale tested David De Gea in goal with a fantastically taken free kick but the ball struck the post and trickled out for a goal kick. Second half also saw Xabi Alonso subbed off due to an injury which looked like precautionary with the medical staff looking at his knee. The surprise of the game was reserved for the 74th minute when Cristiano Ronaldo stepped up to replace Alvaro Arbeloa. As the electronic board showed the number 7 on the screen, a huge crowd of 109,318 in Michigan made noise for the Ballon d’Or winner. However, Cristiano didn’t get much to do as the movement of the ball and creation of chances was poor by the Blancos. Against the run of play, Chicharito scored with a header courtesy a Shinji Kagawa assist. Both Pepe and Carvajal in the centre left their man free and Iker’s desperate lunge forward was what it was - desperate. Caught in no-man’s-land, Iker’s punch attempt was miserable and that allowed the Mexican to score freely. In the end, it brings to an end a miserable pre-season tour of the United States which aside from Bale has had little to no positives to offer.